A school health programme and health camp was organized by College of Nursing, AIIMS, Raipur on 01/02/2019 and 02/02/2019 at Chhattisgarh Sashkiya Purv- Madhayamik Vidhyalyaya, Mohba Bazar. 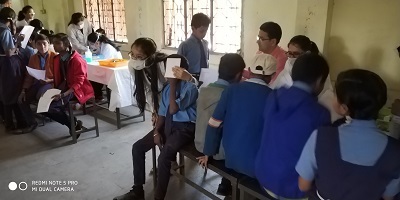 Health check –up was done for 340 students of Intermediate and high school which included examination of height, weight, nutritional status, general health status, eye, dental , ENT and Mental health examination. 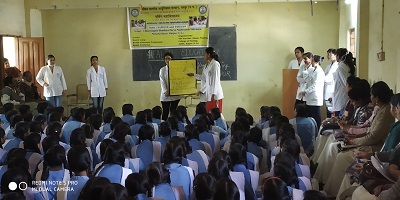 As part of the programme Health awareness programme on personal hygiene, dental hygiene, menstrual hygiene, reproductive health education, substance abuse and prevention of accidents was organized by 4th year B.Sc. (Hons.) nursing students. The programme also included an Exhibition of various models on water purification, rainwater harvesting, communicable and non-communicable diseases. The programme succeeded in identifying various minor ailments and disorders among school children and identified cases were referred to higher health facilities. 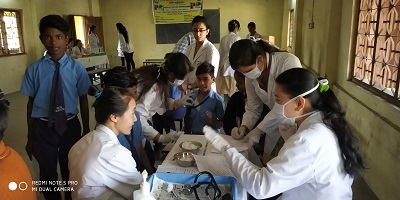 The programme helped in creating awareness on the important health issues among school age and also in providing a learning experience to the nursing students to address the school health problems and needs of children and how they need to take part in health promotion.